There are several steps involved to prepare for a successful deployment of Windows Server 2008. Create Unattended XML files to be used to auto attend to the WIM files. WDSClientUnattend.xml attends to boot.wim, and AutoUnattend.xml attends to install.wim. 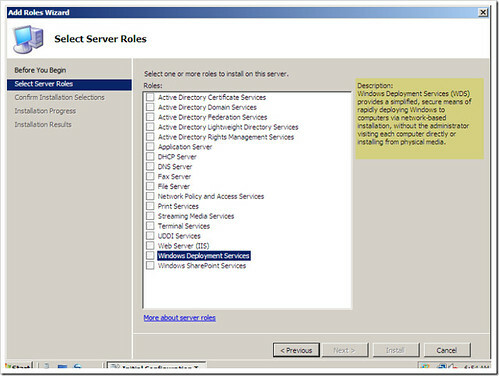 To install it on Windows Server 2008 it is practically the same procedure, just add the Windows Deployment Services role from the "Add Role Wizard". After that, all the configurations tasks are the same, since it is the same snap-in; and you’ll get bonus options using WDS on W2K8, like multicasting transmissions. 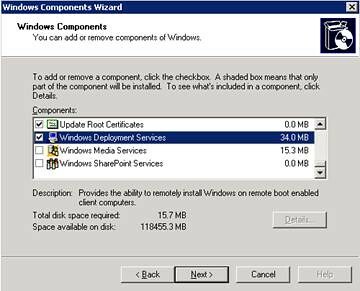 To install Windows Deployment Services on Windows Server 2003 SP1 first you must install the "Remote Installation Service" (RIS) component, you will not need to configure anything special with this component. 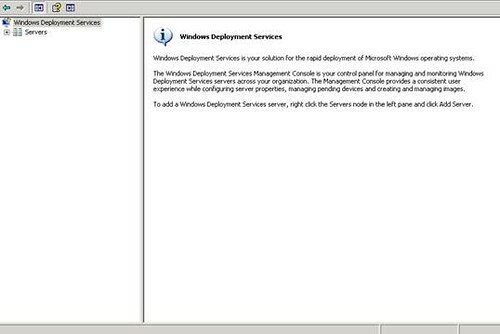 After that, you have to use WAIK media, in the options you will find the Windows Deployment Services for installation. 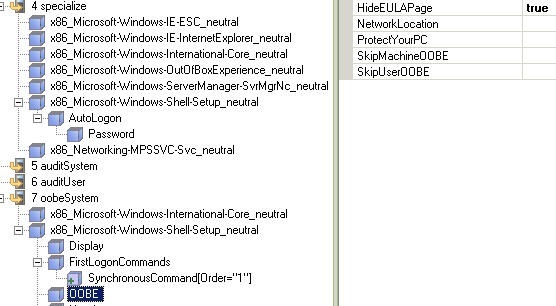 The difference between known clients and unknown is decided if the Computer Object exists on Active Directory. On the final step of the wizard, select to start adding images and that’s it. The boot.wim file is used only for the first initial part of the deployment process, which means the only part you will need to do is add in any mass storage drivers, so that you will be able to deploy the OS. To do this, you will need to mount the boot.wim image. In this example, this is for x86, you will need to do the same for x64. Create a folder on your workstation’s C: drive called Mount (if it doesn’t exist). Next, make sure you have the drivers you want to integrate unpacked and local on your workstation. Run the following command to integrate those drivers: "C:\Program Files\Windows AIK\Tools\PETools\peimg.exe" /inf=C:\Driver\driver.inf c:\mount (replace Driver\driver.inf with the absolute path to your INF). If that’s successful then all you need to do is delete the boot image in WDS and then re-add it. Add in the .XLM files in here for each architecture. 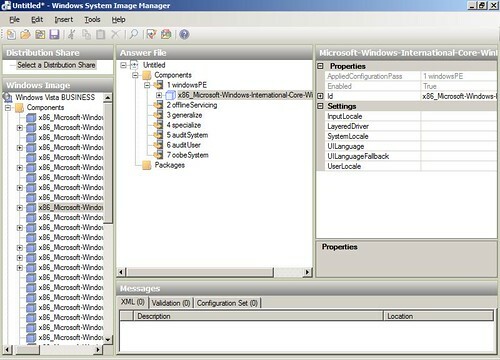 .WIM files are single instance storage image files, and the install.wim file for the OS contains 6 Windows Server 2008 images in each x86 and x64 versions. They are all indexed with different index numbers in each .WIM file. To find out what is inside an install.wim file, you need to run the following command. 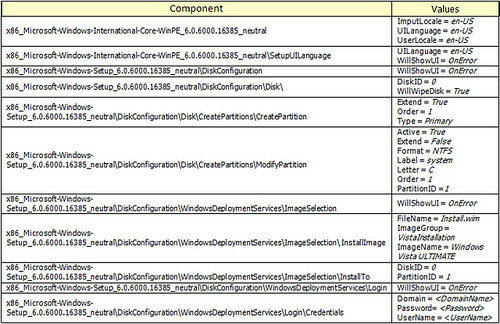 "C:\Program Files\Windows AIK\Tools\x86\imagex.exe" /info "X:\Distribution\Operating Systems\WinSvr2008\sources\install.wim"
Below you will notice that in one install.wim file, there are 6 different images with a single instance, each separately indexed. You can append to the install.wim file with other images (more than 6) that you have mounted from different .wim files using the syntax /APPEND image_path image_file "image_name" ["description"]. Load the .WIM image file that you want to add files to (scripts & applications). Remember to do this as many times as you need for each image index number. During the deployment process there are two separate builds, one for Domain Controllers and one for everything else. 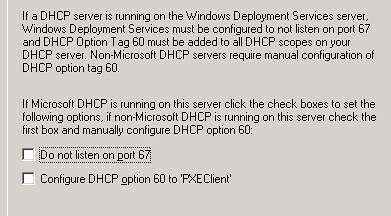 The difference is that with the domain controller, Symantec Net Backup is not installed. 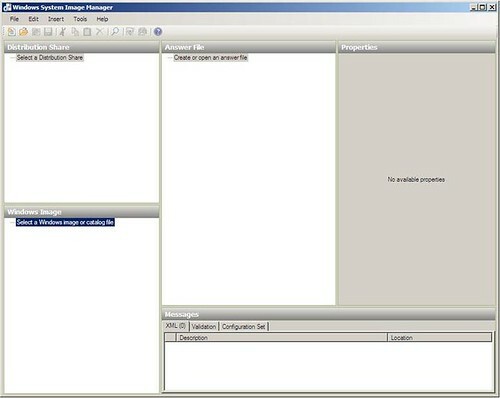 However two additional Windows Server 2008 features are installed, Remote Server Administration Tools and Group Policy Management Console. For post deployment, the post deployment script (install.vbs) will automatically search the registry for extra information. For my example, I’ll be using two sets of each architecture specific files, one WDSClientUnattend.xml and two AutoUnattend.xml files, AutoUnattend_DC.xml (for Domain Controllers) and AutoUnattend_Generic.xml (for Generic builds). Below is an example of AutoUnattend_DC.xml the only difference is that it executes a different command at first logon. Copies robocopy.exe to the local system32 directory of the newly deployed server. Also copies a buildpurpose.txt file to the c:\install\script directory based on which OS build is being deployed. 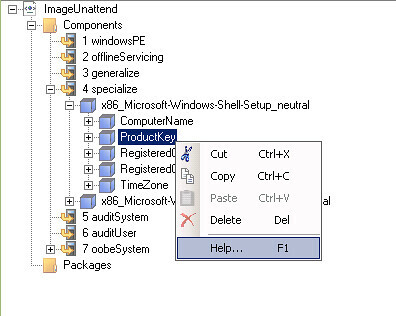 Uses RoboCopy.exe and mirrors the folder \\inftwsm005.adtest.unsw.edu.au\distribution$\Control\WinSvr2008\install with c:\install, and ignores the buildpurpose.txt file. To actually create the .XML files, use windows System Image Manager and select the components that are necessary for the answer files. From the file menu select New answer file. Once the file is validated click on Save and use the name AutoUnattend_DC or AutoUnattend_Generic. 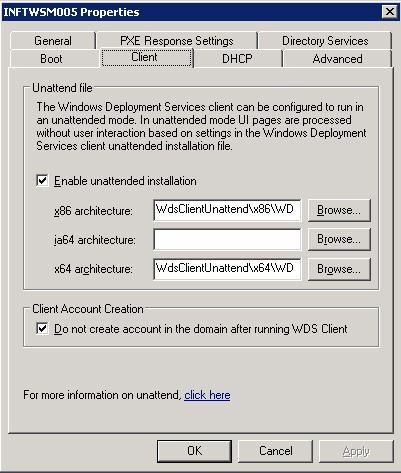 Locate this answer file D:\RemoteInstall\WdsClientUnattend on the Windows Deployment Server. 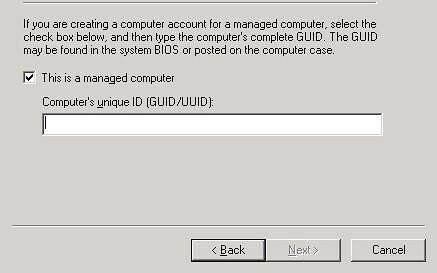 c) Open the Client tab and select Enable Unattended Installations. d) According to the architecture where you created the image, browse for each WDSClientUnattend.xml files. a) On the Installation Images, and in one of the Image Groups, right click on the first image, select properties. b) Select the option Allow image to install in unattended mode. hi marc very exlant to your job best guid to me very usefull side very thanksss…………….